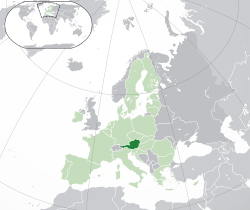 ক. Austrian Sign Language is a protected minority language. ঘ. Austrian schilling before 1999; Virtual Euro since 1 Jan 1999; Euro since 1 Jan 2002. ঙ. The .eu domain is also used, shared with other European Union member states. ↑ Schlechtes Integrationsklima bessert sich diepresse.com (2012-07-09).